This year, during the month of June, I had the blessing of spending a month in Bangladesh at CRP – the Centre for the Rehabilitation of the Paralysed. CRP was founded in 1979 by a British physiotherapist in an effort to help meet the astounding rehabilitation needs in one of the world’s poorest and most densely populated nations. Incidents such as the Rana Plaza factory collapse that made international headlines last year as well as an overall high rate of motor vehicle and farming accidents place clinical practitioners involved with rehabilitation in high demand. 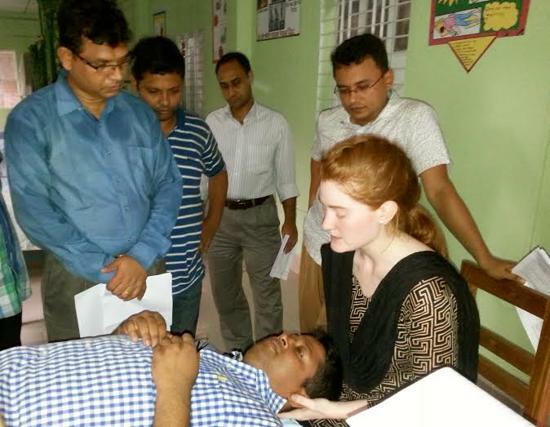 In addition to their clinical facilities, CRP is also home to the Bangladesh Health Professions Institute (BHPI). BHPI has grown significantly over the past several years and offers undergraduate degrees in physiotherapy, occupational therapy, speech therapy and nursing. 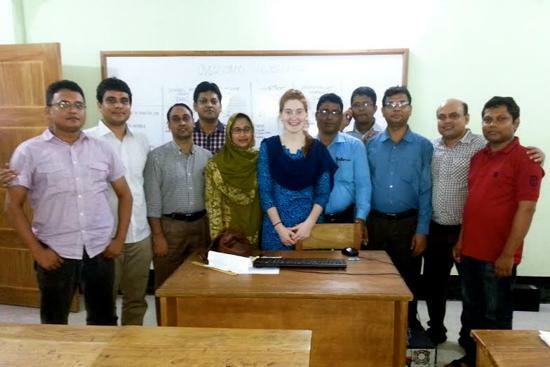 In an effort to advance the profession of physical therapy and to promote its integrity in the Bangladeshi society, BHPI has recently developed a 2-year Master’s of Physiotherapy (MPT) program. The first rotation of students is currently in its second year and is comprised primarily of senior clinicians who are returning to obtain a Master’s degree. As a new graduate from a U.S. DPT program, I was asked to spend the majority of my time working with this new MPT program. Over the course of 4 weeks I presented lecture and lab-based classes reviewing common special tests of the spine and upper and lower extremities. Additional course session topics included vestibular rehabilitation and academic writing. This seems obvious, and it is; but what I want to communicate is that it was while teaching on topics of which I truly perceived I could ‘bring something to the table’ that I felt the real joy of teaching. Certainly there are times when we are required to teach on subjects with which we are unfamiliar; but whenever possible, I want to teach on that with which I am familiar because that is where education will fill it’s most natural, and I believe, effective, role. Further, I am challenged to put forth effort to continue to seek out knowledge in areas that I will likely be called upon to share, especially with patients. 2. Good preparation takes time. A lot of time. A large majority of my time at CRP was spent preparing for the class sessions. From deciding on the appropriate information to present, to physically collecting the information and formatting it for the presentation I spent countless hours on what would only be an hour-long session. With practice and experience, the preparation will likely take considerably less time but, nonetheless, it is a good reminder to invest in the preparation period and to give credence to it as a necessary component, however long it may take. The particular student group with which I was working was comprised of clinicians from a variety of PT disciplines, representing a considerable range in familiarity with the topics being taught. Due in part to cultural differences and language barriers, but more broadly to this range in knowledge, it was difficult to form an initial assessment of the group and, as such, the learning needs. My time being so short – only 4 weeks - this fact did, I believe, negatively impact the effectiveness of the classes, specifically those toward the beginning of my time there. The experience did, however, re-emphasize the importance of gaining an understanding of those being ‘educated’ and ideally, before attempting the education process. During my time in PT school, it was always interesting to me how each student would grasp a concept at a different time. Core principles and themes were returned to throughout the curriculum but it was perhaps the contextual environment of one particular repetition or the method of presentation that would catch an individual student and solidify the idea in his or her mind. I can distinctly remember my surprise to discover that concepts that I only truly understood in my second year were referred to numerous times even early on. It is very difficult to know when or how someone will truly learn something – as such, grace and patience is needed. I am so thankful to CRP for allowing me to spend time with them again this year. Experiencing a profession as it functions in a different setting offers a wonderful opportunity to reflect on the advantages and disadvantages of your particular setting; international work provides a tremendous, even ideal environment in which to do this. I have a deep respect for those working at CRP and with BHPI. The political and social climate in Bangladesh can make PT practice challenging as it has limited regulation and structure. But the profession clearly continues to progress in the right direction and the MPT program is evidence of this. Here’s to a life of learning and sharing knowledge. Suzanne Adkins recently graduated from Northwestern University with her Doctorate in Physical Therapy. Having spent the majority of her childhood in Southeast Asia, Suzanne is interested in the practice of physical therapy throughout the world and in various cultural contexts. She has had the pleasure of visiting and working with therapists at the Centre for the Rehabilitation of the Paralysed in Bangladesh on several occasions and looks forward to international work in the future.